World War I was a watershed experience for immigrants who arrived at the turn of the twentieth century. Though the majority supported their new country, those suspected of harboring sympathies for their homeland—if the United States was at war with that homeland—were restricted in movement and sometimes interned in camps. 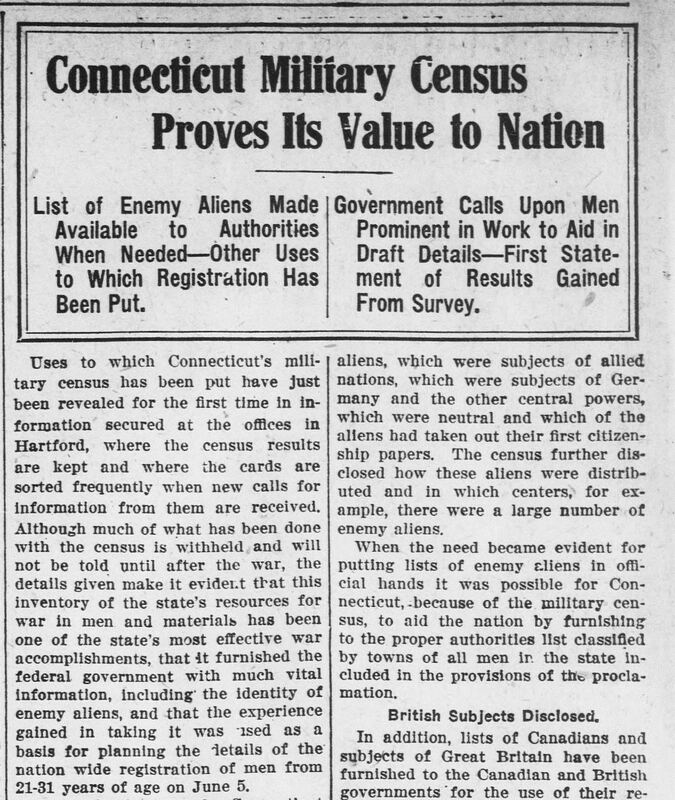 How did the government effort to mobilize and monitor the Connecticut home front during World War I affect the immigrant experience and conceptions of national identity? How did the government define an “enemy alien” during the First World War? What were some of the steps taken in Connecticut to regulate the activity of “enemy aliens”? How did immigrants from Germany and the Austro-Hungarian Empire who were living in Connecticut react to the WWI-era mobilization efforts? 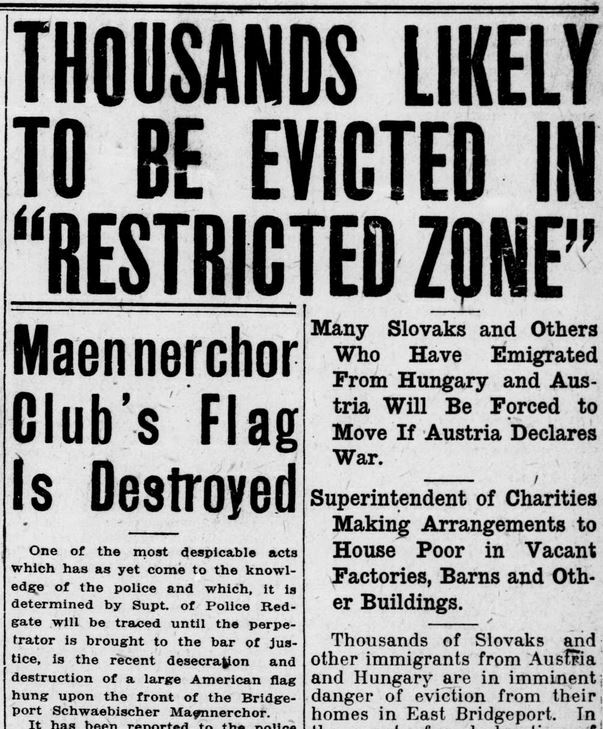 “Thousands Likely to Be Evicted in ‘Restricted Zone,’” Bridgeport Evening Farmer, April 14, 1917. Chronicling America: Historic American Newspapers, Library of Congress. 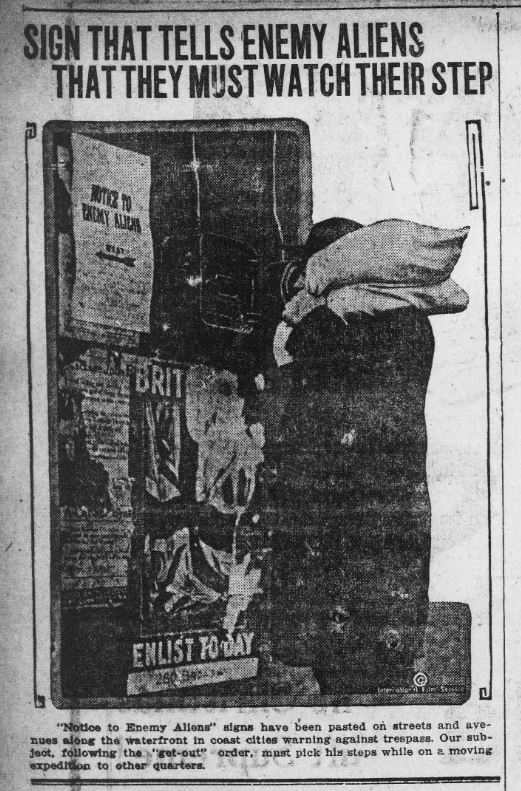 “Sign Tells Enemy Aliens That They Must Watch Their Step,” Bridgeport Evening Farmer, December 11, 1917. Chronicling America: Historic American Newspapers, Library of Congress. 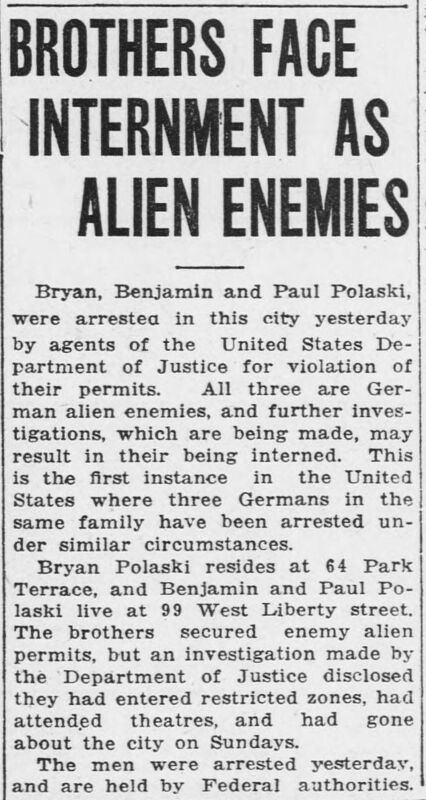 “Brothers Face Interment as Enemy Aliens,” Bridgeport Times and Evening Farmer, May 14, 1918. Chronicling America: Historic American Newspapers, Library of Congress. 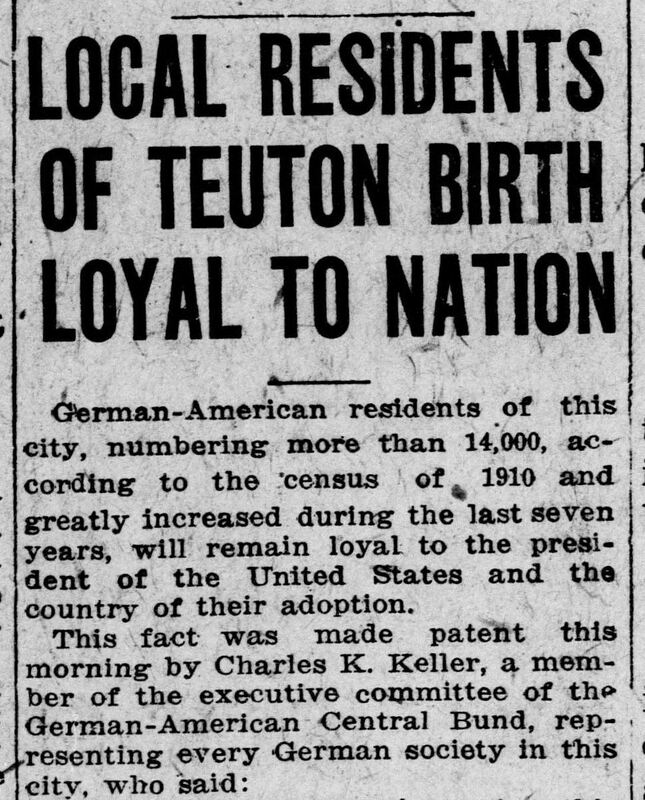 “Local Residents of Teuton Birth Loyal to Nation,” Bridgeport Evening Farmer, February 5, 1917. Click on the image to read the entire article. Chronicling America: Historic American Newspapers, Library of Congress. 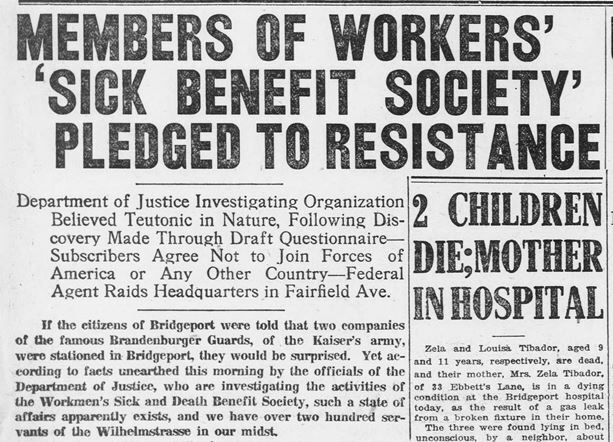 “Members of Workers’ ‘Sick Benefit Society’ Pledged to Resistance,” Bridgeport Times and Evening Farmer, January 4, 1918. Chronicling America: Historic American Newspapers, Library of Congress. 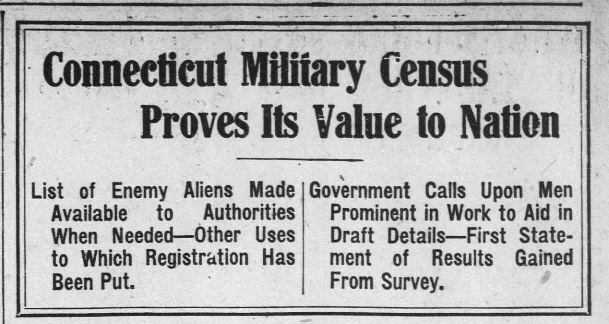 “Connecticut Military Census Proves Its Value to the Nation,” Bridgeport Times and Evening Farmer, January 30, 1918. Chronicling America: Historic American Newspapers, Library of Congress. 1. Divide students into groups and assign one or more of the selected articles to each group. How did immigrants from Germany and the Austro-Hungarian Empire living in Connecticut react to the WWI-era mobilization efforts? 3. Have students list questions that are posed–but not answered–by the articles. Ask them to think about what kind of sources, especially primary sources from the time, might help them answer these questions. 4. As a follow-up, students can use the Chronicling America database at http://chroniclingamerica.loc.gov to find editorials or letters to the editor in Connecticut newspapers that present contrasting viewpoints regarding the enemy alien program. Different newspapers printed their editorial and opinion pieces on different pages. “Limit search” to Page 6. “Limit search” to Page 4. Based on what they have learned so far, students will imagine they were a resident in the state during World War I and write their own letter to the editor in response to one of the historic articles on the enemy alien program. Students will use contemporary newspapers to investigate immigration issues today and will create a graphic organizer illustrating similarities and differences between issues today and those during WWI. These may include the cultural/racial/religious background of immigrants in question, language/words used in newspaper coverage, proposed “solutions,” etc. The Connecticut Students for a Dream offer a list of agencies and organizations that exist to aid immigrants today: Visit one of the centers listed to learn about the experience of immigrants in Connecticut today. Or, choose an ethnic heritage center in your town and arrange for students to interview elders whose ancestors immigrated about their family stories. Visit the website of Integrated Refugee & Immigrant Services (IRIS) and learn about their work to resettle Syrian war refugees in Connecticut. Watch the CNN video that explains their efforts. Reflect upon the way that Connecticut history can be used to frame discussions about our state’s choices today. Laskin, David: Ethnic Minorities at War (USA), in: 1914-1918. International Encyclopedia of the First World War, ed. by Ute Daniel, Peter Gatrell, Oliver Janz, Heather Jones, Jennifer Keene, Alan Kramer, and Bill Nasson, issued by Freie Universität Berlin, Berlin 2014-10-08. Phelps, Nicole M.: Austro-Hungarian Enemy Aliens (USA), in: 1914-1918. International Encyclopedia of the First World War, ed. by Ute Daniel, Peter Gatrell, Oliver Janz, Heather Jones, Jennifer Keene, Alan Kramer, and Bill Nasson, issued by Freie Universität Berlin, Berlin 2014-10-08. Stibbe, Matthew: Enemy Aliens and Internment, in: 1914-1918. International Encyclopedia of the First World War, ed. by Ute Daniel, Peter Gatrell, Oliver Janz, Heather Jones, Jennifer Keene, Alan Kramer, and Bill Nasson, issued by Freie Universität Berlin, Berlin 2014-10-08.